You will see a lot written about bluffing in poker. Super aggressive maniacs will base their betting strategy on knocking people off pots and will therefore focus a great deal on bluffing. But poker is far more complex, although the semi-bluff should still be a vital part of your poker arsenal. So what exactly is a poker semi-bluff? Well the simple definition is whenever you bet with a hand that has good potential to become the best hand by the river, you are semi-bluffing. You are bluffing because you currently have no hand when you bet. However, you have good “outs” to end up with the best hand by the time the last card is dealt. And that’s why this tactic is called a semi-bluff, not a pure bluff. You are betting with “something”, not simply with air. 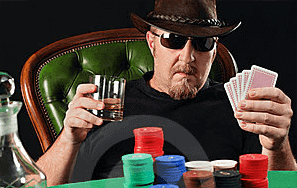 Why is a semi-bluff a good poker betting strategy? The profit you earn from playing semi-bluffing poker comes from having two ways in which you can win the pot. If your opponent folds to your bluff bet, then your bluff will work and you get paid off. While if you actually make your draw you win by having the best hand. This makes it hard to counter semi-bluff poker plays because it is difficult to determine when your opponent actually has a hand, when he is pure bluffing and when he is chasing a monster draw. If a player varies his play correctly, he can keep his opponents guessing. Of all the species of poker animal out there, the tight aggressive players will find semi-bluff poker betting strategies more profitable because fewer players in general will call their bluffs. 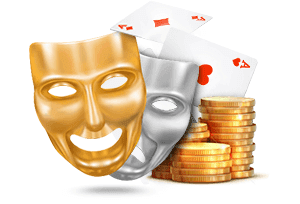 Their table image has been cultivated to show a player who aggressively plays a few good hands. Thus opponents will often fold to their semi-bluff bets. Although many players understand what a semi-bluff is, they rarely use it correctly. Many beginners make the costly mistake of betting when they should be checking, and checking when they should be betting. The more pot equity you have, the more likely you are to win by making your draw. 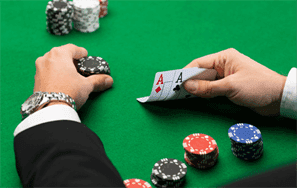 Fold equity refers to the chance of getting your opponent to fold. Therefore, the more pot equity you have, the less you need to worry about your opponent folding. While, the more timid and cautious your opponent is – and thus the more likely they are to fold – the less pot equity you need (and that is why pure bluffs work so well against timid players). Before you fire off a semi-bluff bet, look at the board and try to gauge its texture. Remember, a bluff of any type has to tell a believable story otherwise you are going to get caught with your hand in the cookie jar. If you raised before the flop and the flop came down T-7-2 with two clubs that make you four-to-a-flush, you would probably check to peel off another card if you are sat holding with QcJc. If a King of Hearts fell on the turn, then a semi-bluff bet here could scare off your opponent. Overcards are good for representing big cards, especially if you were the pre-flop raiser. This is yet another argument for being an aggressive player. However, if the board signals danger, with the turn card pairing the board, checking could be a better option. Taking a free card could cost you less money if your opponent is sandbagging a monster. Bad boards and dangerous flops are never good places to throw out a bluff – unless you want to give your money away. Don’t forget that only a maniac thinks that betting at every pot is an aggressive strategy. What they’re doing is simply throwing away chips. Your table image, the texture of the board, and your opponents’ playing style should all be taken into consideration when gauging your fold equity. Now that we have looked at what the semi-bluff is, and some dos and don’ts associated with it, let us turn to some examples of play and see the semi-bluff in action. The action is folded to the third player, who's a little bit loose but also very aggressive when he enters pots. He raises and your put him on a range of 9-9+, KQs, AJs, AQs, AKs, AQo and AKo. The action continues to the button. She is a loose and passive player that believes folding before the flop is boring, so she calls. You call as well and there is now a total of $26 in the pot. You check, and the preflop raiser bets. The button calls. You have an inside straight draw and two overcards giving you ten outs (six for the overcards and four for the straight draw). At this stage it's not a bad situation to call. You have to bear in mind that one of your opponents could be holding a pair of queens or higher, which would make your overcards dead. You call anyway and the pot grows to $38. You check again, and again the aggressive player bets. The button finally folds, having wasted $12 of her money to see some random cards. With that last bet the pot is now $46, or 5.75 big bets. Let's turn our attention to the aggressive opener and his range again. He will not fold any of his pocket pairs here, but would he fold an ace-high hand? If he would, a checkraise could be a good play here. The reason this tactic may be profitable is because of the combined chances of him folding and the chance that, when he doesn't, you still make the best hand (pot equity + fold equity = profitability). Given the range we put him on preflop, there are 36 ways he can have a pocket pair (9-9, T-T, J-J, Q-Q, K-K or AA, multiplied by 6 combinations for each one). There are 12 ways for each of the non-paired hands AK and AQ, and there are four ways each to make KQs, AJs, AQs and AKs. If all of them have equal outcomes - i.e. he'll be as likely to bet KQs here as AA - there are 36 hands he will not fold when we checkraise (his pocket pairs), while there are 40 hands he is likely to fold. To be a bit more conservative, let's say we give him a 25% chance to fold, and a 75% chance to call or raise. If he raises we must fold, as the pot doesn't really grant us the odds we need. But if he just calls – after all, another 2 just fell and even pocket rockets will be afraid of trips - we still have a small chance of hitting our straight. Let's say that the distribution of the 75% of hands he will not fold is that he'll call with 50% and raise with the remaining 25%. Let's work out the expected value of our checkraise. Remember, there are 5.75 big bets in the pot when the action comes to us. 25% of the time, he will fold and we will take down the pot: 0.25 * 5.75 = 1.4375. 25% of the time, he will re-raise and we must fold: 0.25 * (-2) = -0.5 (we invest two bets, and we lose them immediately). 50% of the time, he will call, and we will need to hit our straight on the river to win. This is trickier. There are 4 cards that will give us the straight, so we have a 4/46 = 8.7% chance of making our draw. We also have overcards, and some small percentage of the time, spiking a pair will be enough to win. But for the sake of simplicity, let's just say that when we hit our straight we will win an extra bet on the river, and when we miss, we will always fold. I'm now cancelling out the times where he will fold when we bet our straight and the times we hit our pairs and they hold up. This assumption may not be entirely fair, but we have to draw the line somewhere. Our profit for when we win is 7.75 big bets (the pot will be 10.75, but we have invested 3 of those ourselves). The math is as follows: 0.5 * (0.087 * 7.75 + 0.913 * (-2)) = 0.5 * (0.67425 + -1.087) = -0.206375. (0.087 is the chance we hit our straight, and 0.913 is the times we do not. Everything times 0.5, since he will only call our checkraise half the time; the remaining 50% he will either fold or raise). The sum of the expected value of the checkraise is thus: 1.4375 - 0.5 - 0.206375 = 0.73 big bets. The pot must be somewhat big. Don't risk a semi-bluff with a small pot. Your opponent can't be a calling station. If he won’t fold, we can't semi-bluff. Hitting our outs when he calls is nice, but is actually only about a quarter of the amount we will make from the "bluffing" part. Keep in mind that the largest profits come from making your opponent fold. People can go crazy with straight and flush draws. This is not good poker betting strategy and you should know when to press the gas and when to hit the brake. It is also strange that very few players will bet or raise with two weak overcards, even though they have six outs with this hand and only four with an inside straight. However, bear in mind that when drawing to a straight you are far less likely to be drawing dead. Let’s look at a situation to see some alternative ways to play your semi-bluff outs. The game is $4/$8 Limit Hold’em and there are nine players at the table. Two players in middle position limp and you raise (whether or not you this raise is good is irrelevant for this exercise). The small blind folds and the big blind and both limpers call. The pot is now $34. Everyone checks to you. You know that you probably do not have the best hand right now. It is doubtful whether one of your opponents has a big hand, and their checks indicated that none of them connected with the board. But even K-4 beats you at this point so you need to improve by the turn or river, or drive everyone out of the pot before the showdown. The pot is 8.5 small bets. Anyone holding 8-9 is not going anywhere and even J-8 is probably going to stick around given the implied odds. But someone with a hand like A-5 might fold, which would be very good for you. Does your head hurt? Don’t worry it will get simpler. So, if there's even an 11% chance that your bet will cause everyone to fold, you will show immediate profit. What if we get a single caller? Now we have to make a somewhat accurate estimation of how many outs we have. Pairing our jack or queen gives us six outs, but also results in problems. If our opponent holds J-T or Q-T we are now in big trouble. In that case we do not have six outs, but in fact only three (pairing the card our opponent does not hold). The probability of this (or any other combination where he holds a card that has paired the board plus a jack or a queen) is 6/46 = 13%, presuming random cards. Of course, it's somewhat unlikely that someone limped in with J-3, but Q-T and J-T are certainly not impossible holdings, especially if they are suited. It's also quite possible that the caller is slowplaying two pair or even a set, so let's discount our outs accordingly, and figure that less than 87% of the time (perhaps more like 70%) our overcard outs are clean. 70% of 6 outs is 4.2, and rounded off for bad luck gives us 4 – so we can consider ourselves having just four effective outs. I won’t go through the mass of complex expected value calculations for the rest of the hand as your head is already probably throbbing and, given the number of possible outcomes, makes such calculations extremely convoluted. We learned in the first example that the pot had to be of some size for a semi-bluff to be worth attempting, as most of the value comes from getting everyone to fold. The pot is certainly big enough here for us to give it a shot: 8.5 bets compared to the 1 bet we will be risking. We have shown that you need a success rate of 12% to show immediate profit from this, which, experience shows, is quite possible if the game is somewhat tight. Again, if you know from reads that some of the players involved in the hand always "peel one off" on the flop, you should consider just checking here. If you can't make them fold, you shouldn't try. Instead it’s better to just check and hope that you spike a pair or an open-ended straight draw. Furthermore, we see that our overcards can be just as valuable outs as the inside straight draw in the first example. Semi-bluffing is a powerful weapon and should have a permanent place in your poker arsenal. But it is not kryptonite and won’t be effective when used in the wrong situations. When the pots are small and you are facing players who don’t like to fold, then it is time to put the safety catch on and save your bullets. But when the pot is juicy and your opponents are passive, pass the ammunition because we are going to be shooting from the hip.